Ever make a bad lead? 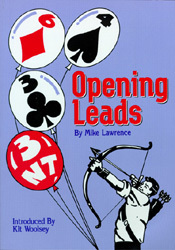 One quarter of the hands you play will feature an opening lead by you. The material in this book covers all of the standard lead considerations plus many that have never seen print. When should you lead an ace against a suit contract? Should you ever underlead an ace against a suit contract? Is leading from a king an awful thing to do? What do you lead when you have three little cards in the suit? Is it always best to lead through dummy’s suit? Can it ever be right to lead a suit that declarer has bid? Do you know when to lead trumps? Is a singleton always a good lead against a suit contract? The answers to these questions and hundreds more are in this book. And at the end of it, there is a comprehensive lead quiz to pull it all together. The material in this book will make you a much better player.